Here I used a very wet application of the same colors from the previous wash (New Gamboge, Quin. Gold and Burnt Sienna) to Scooter's back, where he sports a large brown spot. Be careful to use soft edges where the fur blends from light to dark and dark to light, but use a dry, crisp edge when there is a definite change from one value or color to the next. You can see the crisp edge on Scooter, where the white hair blocks the light and creates a distinct value change in the center of his chest. You can see it again where the brown spot on his back meets the white hair on his shoulder. 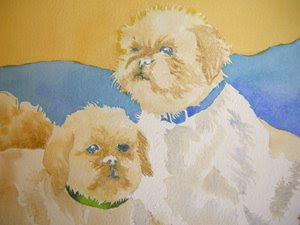 Crisp edges must be painted on dry paper, whether it already has an underlying color or not. Wet paper will create soft edges. More values are developed with French Ultramarine Blue for cool areas, and Burnt Sienna and VanDyke Brown for warm areas.